As of December 31, 2016, when renewing a Vehicle Registration online, you will print your valid registration document at the end of your transaction. A registration card will NOT be sent to you in the mail. You are required to maintain current vehicle registration, and must present the registration credential to law enforcement when asked. Also, you will not receive a registration sticker. Registration stickers are no longer required to be displayed on license plates. In order to get your vehicle inspected, you must have the up-to-date registration and insurance and be sure to bring these documents when you drop off your car. The first 8 digits of your title number. Please be sure to have both your updated registration and insurance when you bring your car in for an inspection. 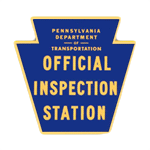 We will not be able to inspect your vehicle unless the paperwork is up-to-date.